Those Singaporeans really know how to take care of people. TOULOUSE, France (AFP) - "There is no first class on this plane, sir. 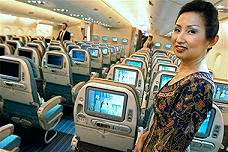 This is Suite Class," repeats the Singapore Airlines steward as she shows off the front of the plane to curious onlookers. All of the guides parroted the same line on Monday as the carrier unveiled what it called a "new standard for luxury and comfort" in the Airbus A380, the world's biggest passenger jet. First class has been rejected by the Asian carrier as a label for the 12 seats on the plane that feature 58-centimetre (23-inch) flat-screen televisions, sheets by French designer Givenchy and a full-length bed with separate mattress. That sounds like first class to me. International airlines put US carriers to shame in how First and Business Class customers are treated. I've flown internationally in Business and First Class. Singapore Airlines was excellent when my wife and I flew Manila to Singapore. Dutch carrier KLM was a little mixed. Their service on cross Atlantic flights is very good, but within Europe, there was little difference between Business and Coach. KLM still sitting three people across on 737 flights I flew between Amsterdam and Zurich, Vienna and Warsaw that I have flown on. Granted there was more leg room up front. For couples with the money, there is an option to join two suites together to make a double bed, forming a self-contained bubble for two with closed sides and complete privacy. Allowing nookie at 35-40,000 feet. That is really taking care of customers.